Twist exhibition stands are the ideal solution for exhibitors looking to join banners together to form a larger display stand. More importantly these display stands are modular and can be designed to fit multiple stand sizes at different events. From a single Twist banner to a large modular linking display stand with multiple banners joined together. Twist exhibition stands are easily adapted to fit any floor space making them a favourite for event managers and organisers. In view of the fact that different size banners can be joined together with linking kits and curved sections. With some clever design and forward thinking all kinds of shapes can be created with your stand. Furthermore using LED lighting and corner graphics panels, this system will give you the flexibility to design a stand that will work for you. Twist exhibition banners can be joined together with the use of the ‘Easi-link’ or ‘Flexi-link’ kits to create seamless graphic layouts over multiple panels. This is due to its patented tensioning system which holds your graphics flat and in position even on uneven floors where tradition straight pop up stands fail to impress. 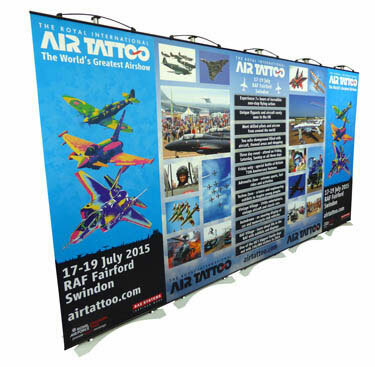 Alternatively Twist banners can be used individually instead of being part of a larger stand. By a way of contrast this freedom to change your display to suit your needs is not possible with most other display stands. Therefore if you are looking to create a flat back graphic wall for your event it couldn’t be easier. To begin with tell us your stand layout and we will supply you with a 3D rendered image of how your stand could look. From the moment you place your order with RGL you can rest assured that the printed graphics for your Twist stands will be fantastic quality. This is because we only print onto premium materials and use premium grade laminates for all of our stands. Besides selling complete Twist systems we also print replacement graphics to fit to the Twist Original banner system. Integrated low voltage LED lights available. Create straight or curved displays. Graphic heights 2000mm, and 2250mm.